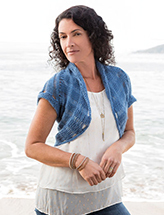 You'll love knitting and wearing this free-spirited tunic. Made of supersoft thick-and-thin, cotton-blend yarn, its A-line silhouette will flatter most figures. 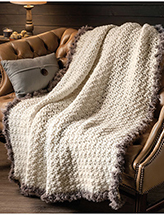 Knit with #5 chunky-weight #3 light-weight DK using U.S. size 5/3.75mm and 9/5.5mm needles. Bust: 45 (38, 42, 46, 50)"
Length: 29 (29 1/2, 30, 30 1/2, 31)"